I am pleased to receive you on the occasion of the presentation of the Letters by which you are accredited as Ambassadors Extraordinary and Plenipotentiary of your countries to the Holy See: Tanzania, Lesotho, Pakistan, Mongolia, Denmark, Ethiopia and Finland. I would ask all of you kindly to convey my sentiments of gratitude and respect to your various Heads of State, with the assurance of my prayers for them and for your fellow citizens. The patient work of international diplomacy in promoting justice and harmony within the concert of nations is grounded in a shared conviction of the unity of our human family and the innate dignity of each of its members. For this reason, the Church is convinced that the overarching goal of all diplomatic activity must be development, the integral development of each individual man and woman, children and the elderly alike, and the development of nations within a global framework of dialogue and cooperation in service of the common good. This year that marks the seventieth anniversary of the adoption by the United Nations of the Universal Declaration of Human Rights should serve as a summons to a renewed spirit of solidarity with all our brothers and sisters, especially those suffering the scourge of poverty, disease and oppression. None of us can ignore our moral responsibility to challenge the “globalization of indifference” that all too often looks the other way in the face of tragic situations of injustice calling for an immediate humanitarian response. Dear Ambassadors, ours is a time of truly epochal changes, which calls for wisdom and discernment on the part of all those concerned for a peaceful and prosperous future for coming generations. 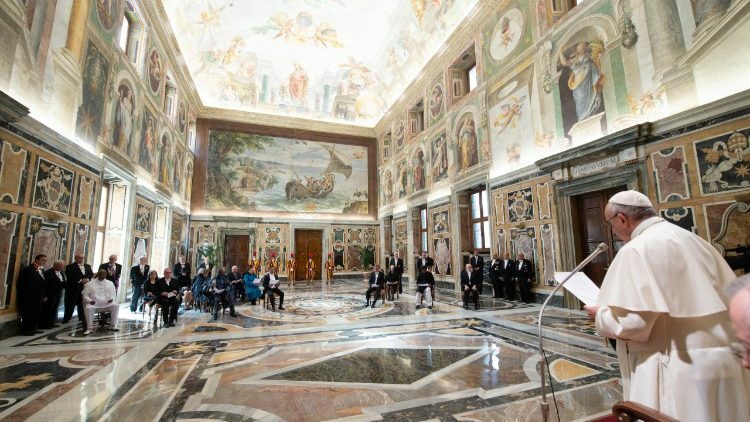 It is my hope that your presence and activity within the diplomatic community of the Holy See will contribute to the growth of that spirit of cooperation and mutual concern essential for an effective response to the far-reaching challenges of our day. For her part, the Church, convinced of our responsibility for one another, promotes every effort to cooperate, without violence and without deceit, in building up the world in a spirit of genuine brotherhood and peace (cf. Gaudium et Spes, 92). Among the most pressing of the humanitarian issues facing the international community at present is the need to welcome, protect, promote and integrate all those fleeing from war and hunger, or forced by discrimination, persecution, poverty and environmental degradation to leave their homelands. As I had occasion to reiterate in my Message for this year’s World Day of Peace, this problem has an intrinsically ethical dimension that transcends national borders and narrow conceptions of security and self-interest. Notwithstanding the complexity and delicacy of the political and social issues involved, individual nations and the international community are called to contribute as best they can to the work of pacification and reconciliation through decisions and policies marked above all by compassion, foresight and courage. Dear Ambassadors, as you now begin your new mission, I extend to you my prayerful good wishes. I also take this opportunity to assure you of the constant readiness of the various offices of the Roman Curia to assist you in the fulfilment of your responsibilities. Upon you and your families, your collaborators and all your fellow citizens, I cordially invoke God’s blessings of joy and peace.